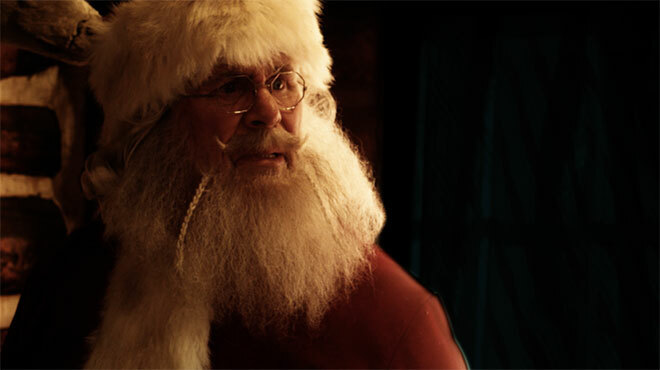 Plenty of B-movies dream of a fright Christmas (there could almost be a sub-genre of Santa slasher films), but few successfully pull it off; either the inherent goofiness tends to get in the way of all the killing, or vice versa, but rarely do the filmmakers seem to be able to nail down a tone. While there is a schlocky charm to splatterfests like Silent Night, Deadly Night or ridiculous premeses à la Jack Frost (he’s chillin’ and killin’) and Jack Frost 2: Revenge of the Mutant Snowman (he’s icin’ and slicin’), most of the time the most clever parts of these cinematic lumps of coal lies in the puns (Santa Claws). Following in the footsteps of some of these video box treasures is director Dan Walker’s Slay Belles, a movie that also wants to have its bloody fruit cake and eat it too. Once again, however, though the flesh may be willing, the killer holiday spirit is just a little too weak. Capitalizing on the recent Krampus trend, Slay Belles sees three cosplaying webcasters stranded at an abandoned Christmas theme park where the Christmas demon just happens to have woken after years of slumber. And of course, he’s brutally murdering children in the surrounding area, confounding local idiot police and (for some reason) a moronic park ranger. The kicker? The old hermit who owns the derelict park just happens to be the real Santa Claus, and he needs the young women’s help in taking down the merciless beast — who also just happens to be his brother. On the scale of Christmas horror movie scenarios, this may not be the most outrageously promising, but there is some potential. However, it’s the execution — and executions — that really matter, and in this department the film feels a little understocked with toys. It’s hard to tell if the initial setup is some kind of satire on lame YouTubers, but the hijinks perpetrated by the three urban-exploring heroines don’t come close to passing as rebellious, daredevil, or realistically entertaining; revealing outfits and blue hair alone isn’t enough to gain a following of online subscribers these days, guys. This shtick comes off like some old fogey’s idea of what the kids nowadays think is cool, and if that’s meant to be the joke, then it doesn’t go far enough (though the manufactured enthusiasm in regards to the mundane is spot-on). The violence also stays away from any real extremities, and the fun suffers for it. This is a movie called Slay Belles after all — isn’t a decent amount of splashy death implied? Having the ladies karate-chop the Krampus should just be the start, but the action never really ramps up from there. Though there are a couple of squishy moments, including one that involves Critters-like balls of flesh (a scene which also doesn’t exploit its true potential for zaniness), only once do we actually get to bear witness to the hairy beast doing the evil deed; usually it’s just distorted flashes of the aftermath. There’s very little actual Krampus fodder here, which is a curious choice in a monster movie. On top of that, the repeatedly half-hearted reactions of the cops to these grisly murders also undermines both the horror and the humor by committing to neither. Stupidity for stupidity’s sake is rarely funny (even in a comedy), especially when cutting away from the main action to promote a tired routine that contributes nothing. That lack of a killer instinct for both comedy and horror doesn’t make Slay Belles a complete wash; at a brisk 77 minutes, it’s still quite watchable for fans of Saturday afternoon SyFy fare. Barry Bostwick is a hoot as a grizzled, hillbilly Kris Kringle, sometimes winking in godlike indifference to the mere mortals, sometimes furious at their ineptitude. The belles themselves (Kristina Klebe, Susan Slaughter, and Hannah Wagner) are sufficiently charming despite their various degrees of forced whimsy, though the screenplay certainly doesn’t assist them much in that regard. Most notably, what little time is given over to special effects — like a sparkling magical staff or a werewolf-like Krampus suit — showcases an attention and skill that the rest of the production doesn’t match. Still, in a genre that lives or dies by its inventiveness, Slay Belles is like socks for Christmas. No matter how serviceable, it’s bound to disappoint fans who look at the wrappings and imagine something far more exciting to unpack on movie night.